By grrlscientist on September 10, 2009. AdÃ©lie penguins, Pygoscelis adeliae, and chicks. 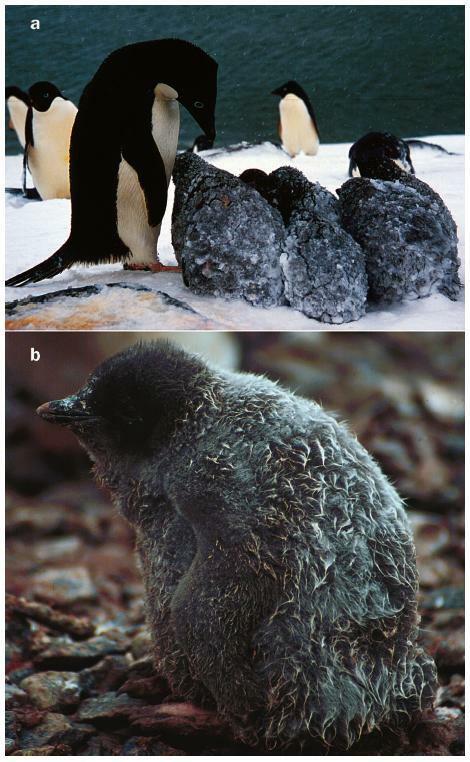 (a) AdÃ©lie penguin chicks may get covered in snow during storms, but beneath the snow their down is warm and dry. (b) When rain falls, downy AdÃ©lie chicks can get wet and, when soaked, can become hypothermic and die. According to an article that was just published in the journal BioScience, penguin populations are declining sharply due to the combined effects of overfishing and pollution from offshore oil operations and shipping. Dee Boersma, professor of biology and the Wadsworth Endowed Chair in Conservation Science at the University of Washington in Seattle, has been studying Patagonian (magellanic) penguins, Spheniscus magellanicus, at Punta Tombo, Argentina, for almost 30 years. In her paper, she reports that their numbers have declined by 22 percent since 1987. Boersma, who is the world's penguin expert, argues that the birds are "marine sentinels" because they are high on the marine food web. Further, because they nest on land, they are highly visible to humans during their breeding season -- unlike most marine animals. 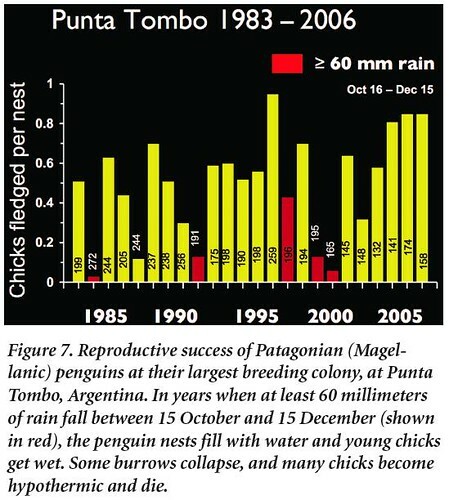 In her paper, Boersma discusses some of the lessons learned from her decades of research of the penguin colony located at Punta Tombo, Argentina. Magellanic (Patagonian) penguins live on the Falkland Islands and on the coasts of Argentina and Chile. The Punta Tombo colony was the largest, numbering approximately 400,000 pairs of Magellanic penguins in the late 1960s, but as of 2006, the population declined by half. What happened? Did the adult penguins move to other, better, nesting sites? 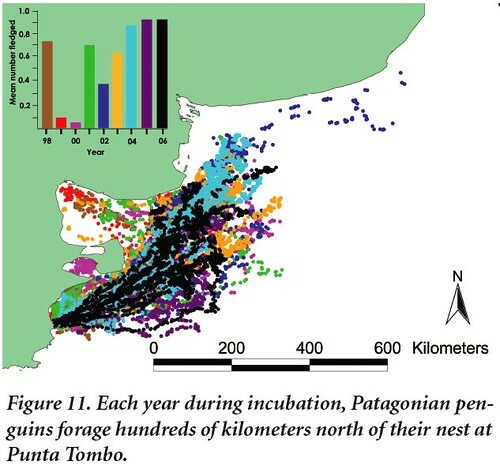 Even though it is possible that the Punta Tombo Magellanic penguins chose to nest in other locations, it has been established that they display remarkable site fidelity: out of 54,361 birds banded by Boersma and her students throughout the decades, only 149 were recorded at a colony other than where they hatched. 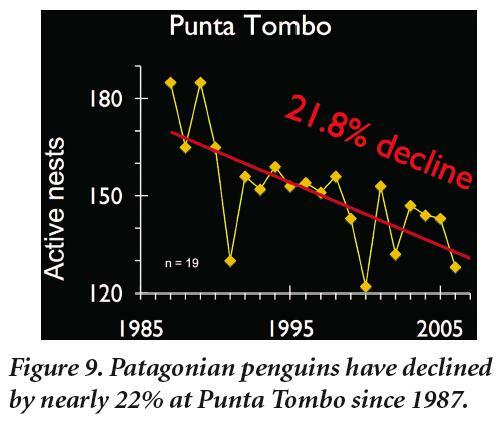 So this dramatic population decline at Punta Tombo is not the result of a mass migration of birds to other, more suitable nest sites. If you look carefully at these data, you will notice that the penguin population drops dramatically in 1991, 2000 and 2002. There were oil spill in those years. Volunteers who walked the beaches of Punta Tombo after the 1991 event made the sad discovery that more than 20,000 penguins died as a direct result of this one spill. But oil is common in the waters along the northern coast of Argentina and Uruguay. Illegal dumping of ballast water and frequent oil spills take a huge toll: Boersma and her colleagues estimated oil spills and petroleum pollution alone claim the lives of 20,000 adults and 22,000 juveniles each year (data not shown). But seemingly benign human activities are also taking their toll on the penguins. Ecotourism, which is growing rapidly at Punta Tombo and at other penguin colonies, is having physiological and probably energetic costs for the nesting penguins. 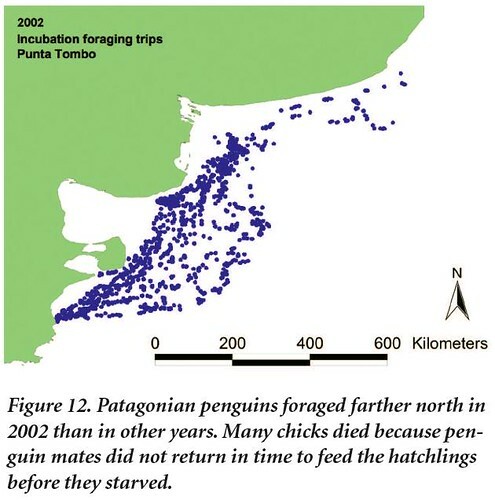 For example, it was shown by Brian Walker, a colleague of mine in grad school, that penguin chicks in tourist areas develop their stress response much earlier than do penguin chicks that are far away from human visitors. Stress has been documented to have many negative effects upon developing bodies, such as diminishing the immune response. Further, the close presence of people visibly alarmed the birds, causing the adults to stand up on alert while chicks burrowed under their parent to hide or triggering begging behavior. Why are the birds traveling so far in pursuit of the fishes necessary to raise their chicks? According to Boersma's data, this is partially due to overfishing but is also due to the effects of climate variation. Other studies have documented that climate change is reducing sea ice and, as a result, is changing the abundance of the marine creatures the birds eat. In her article, Boersma writes that "even small variations can have major consequences for penguins." One of those major consequences is that the birds must routinely travel 40 miles farther from their nests than they did only one decade ago. But Punta Tombo is just one penguin colony comprised of just one species. In fact, there are between 16 and 19 penguin species (depending upon who you argue with), and most penguins nest at just 43 sites, all of which are in the Southern Hemisphere (Figure 1, below). What is happening with those other penguin colonies? 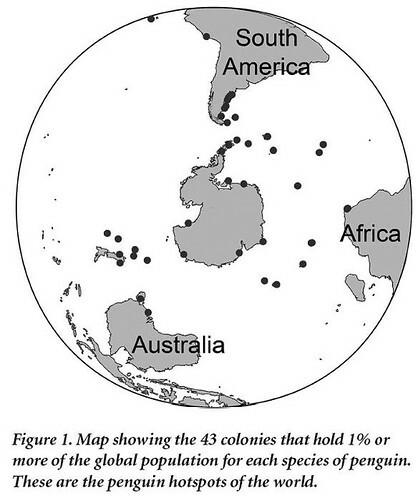 For most of these colonies, population trends remain unclear, so few people know that many penguins are suffering sharp population declines, Boersma writes. She argues that, ideally, each colony should be visited annually at the same time during the birds' breeding season to determine six sentinel parameters: reproductive failure, adult mortality, foraging changes, reproductive success, breeding phenology, and demographic and range changes. But, barring that, she advocates conducting population surveys every five years while the birds are sitting on eggs to monitor the state of the southern oceans. Life is not likely to get easier for penguins. They have to withstand both climate variation and human development. They may not be able to follow their food as coastal development claims their breeding habitat, or their food may disappear as fishers take more and more of their prey. Climate warming is likely to shift prey species, reduce productivity, and make penguin life more difficult. Climate change, petroleum pollution, and changes in their prey distribution and abundance are causing Patagonian penguin populations to move and decline. A 10% decline per decade, in the biggest colony for this species, is simply not sustainable. (p. 606). According to Boersma, penguins are an important sentinel species that provide us with a wealth of data regarding how we are over exploiting the resources, mostly by overfishing and oil pollution, in marine environments. But ultimately, will we listen to what they are telling us? It is up to us to decide whether we will be responsible stewards of marine resources or if we will exploit every last resource on this planet until there is nothing left. The choice is ours. Boersma, P. Dee (2008). Penguins as Marine Sentinels. BioScience, 58(7), 597-607. DOI: 10.1641/B580707.